Kieran Hope, 29, secured financial backing to expand his business Air Control Entech (ACE). A drug dealer caught with £300,000 of cocaine in a police organised crime operation has been given taxpayers' money to grow his drone business. 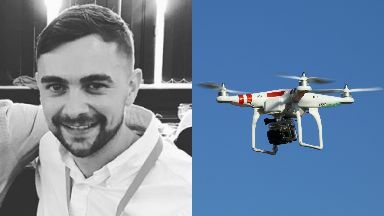 Kieran Hope, 29, was handed a three-year prison sentence in 2014 and two years later founded Air Control Entech (ACE), which uses drones to conduct inspections in the oil and gas industry. He then secured financial backing from The Oil & Gas Technology Centre (OGTC), which is funded by the Scottish and UK governments, academia and industry. There are no rules against convicted criminals receiving public money. However, concerns have been raised over the organisation's refusal to disclose how much it gave to Hope's firm. The OGTC would not say how much money was invested, citing non-disclosure agreements which can keep such details from public view if commercially sensitive information is involved. Graeme Pearson, former director general of the Scottish Crime and Drug Enforcement Agency and ex-Labour MSP and justice spokesman, said: "I think that where public money is being spent there is a duty on organisations to show the public how that money was used and where that money was invested." He added: "The notion that it's none of our business is unacceptable." 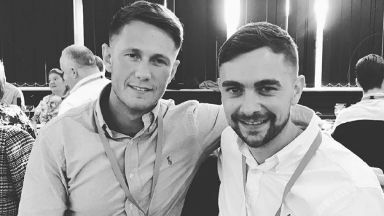 The OGTC declined an interview request, but in a statement said Hope was "entirely transparent about his previous conviction" and that ACE "was carefully evaluated in line with our process for every investment decision and all conditions have been met throughout". In a 2018 business magazine interview, Hope, from Aberdeen, did not mention his criminality. The magazine stated that Hope bought a drone "for fun" in 2015 - the year after he was jailed for three years. Hope said this inspired him to "quit his job in the oil industry within weeks and plough £60,000 in savings and loans into a new venture, Air Control Entech". 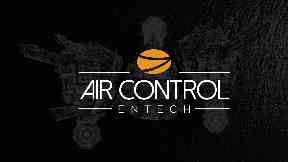 Drone company: Air Control Entech. The magazine also said that Hope has worked in various countries "before he returned to Aberdeen in late 2016" - making no mention of his prison time. Scottish Lib Dem justice spokesman MSP Liam McArthur said transparency should be expected when government money is spent to support a business. "I think the use of non disclosure agreements will strike many as inappropriate and unacceptable in these circumstances," he said. "I think the public have a right to know how public funds are being spent." At the same time as launching ACE, Hope formed sister company Air Control Global Group (ACGG) which he co-owned and ran with Liston Pacitti, 29. Pacitti was last year jailed for four-and-a-half years for endangering lives by selling so-called legal highs from shops in Arbroath and Montrose. At Dundee Sheriff Court last year, Sheriff Alastair Brown said Pacitti had exploited "a gap in the law in order to make significant amounts of money". ACGG was dissolved five months ago. Co-owners: Liston Pacitti and Kieran Hope ran Air Control Global Group. OGTC was launched in 2017 to fund technological developments to maximise North Sea oil and gas yields and more than ten years will receive £90m from the UK Treasury via the Scottish government. Hope's Aberdeen-based ACE was one of the first companies to receive funding. The company said its high-tech drones can carry out offshore inspection work more safely and at less cost than by traditional methods. Former police chief Pearson questioned these claims and why no proceeds of crime action was taken against Hope. He said: "If someone is convicted of supplying drugs and being engaged in the business of drug dealing I would have expected that asset would have been recovered and would have been returned to the taxpayers of Scotland." "I would have hoped that the agency [OGTC] would have taken further steps to ensure that the money was invested in the right places and this man might be the right person to invest in, but it should be done in a situation of openness and honesty." STV News asked the Scottish Government if it was aware of Hope's background and whether using NDAs was appropriate. Energy Minister Paul Wheelhouse said: "We have no involvement in specific funding decisions made by the OGTC, who follow their own due diligence process for all applications, nor would we have any input to commercial or contractual decisions the OGTC enter into." Kieran Hope declined to be interviewed by STV News or to answer any of our questions. But after engaging a PR adviser he spoke about his conviction with an energy industry trade publication. He told Energy Voice that the £300,000 of cocaine was not his and the reason he did not appeal was that it could have resulted in an increased sentence. He said that he had been in with the "wrong crowd" and that his nine months behind bars were "very lonely". After moving to an open prison at the end of 2014 he joined a rehabilitation programme which allowed him to go out and work. He said the company which initially hired him then gave him a full-time role on his release from prison. He says this was followed by another job before he founded ACE in December 2016. "I treat people the way I like to be treated," he said. "Being up front and honest is the right way to do that. "The OGTC was really good about it. A lot of people think you do not deserve a second chance, so it's a case of proving yourself, and that's challenging. "If you mess up, it does not mean your life is over. You can come back if you work hard and are honest."